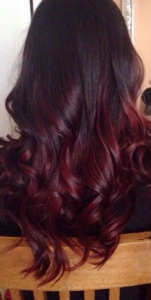 Do you love red hair but dread the time and upkeep required to get a head full of copper or deep burgundy strands? 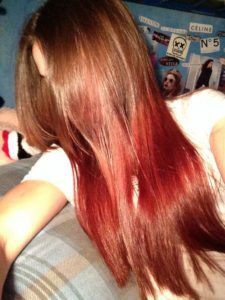 Red ombre hair color offers up the perfect solution to your dilemma, giving you a taste of red in your hairstyle without having to commit to a color from roots to ends. 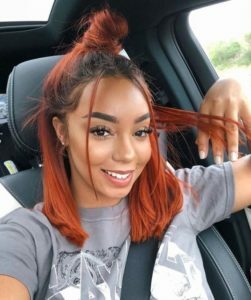 These 20 red ombre hair color ideas will show you that whether your base color is black, brunette, or blonde, there’s a shade of red ombre that’s perfect for enhancing your look. 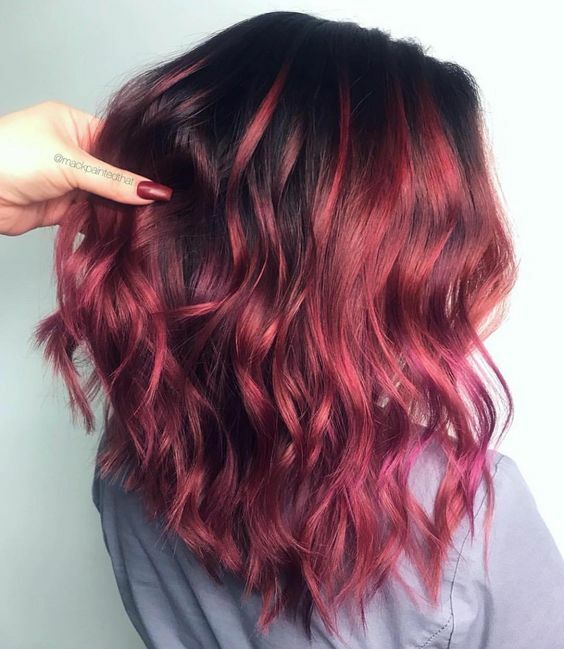 For a red ombre hairstyle that’s full of dark and sultry burgundy tones, try this cherry cola ombre over a deep brunette base color. Red shades this rich look incredible on women with deeper skin tones, but can wash out fair women, especially those with warmer complexions. If you’re hoping a new red ombre hair color will make you look and feel like a fiery red head, look no further than this electric ginger style. 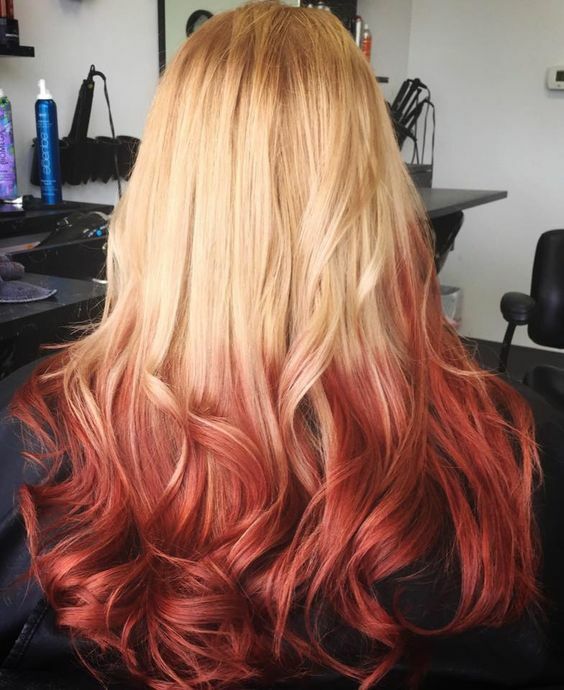 An ultra-bright hue like this will fade quickly, but you can extend the life of your color by washing hair less frequently, and using cold water and a sulfate-free shampoo when you do. A slightly muted shade of ruby helps to create a bold red ombre hairstyle without looking too over-the-top or cartoonish. With some blue undertones in it, this red looks amazing against darker skin tones. We’re more used to seeing ombre hair color on longer styles, but this wine red ombre bob proves that shorter haired ladies should be getting in on the trend too. 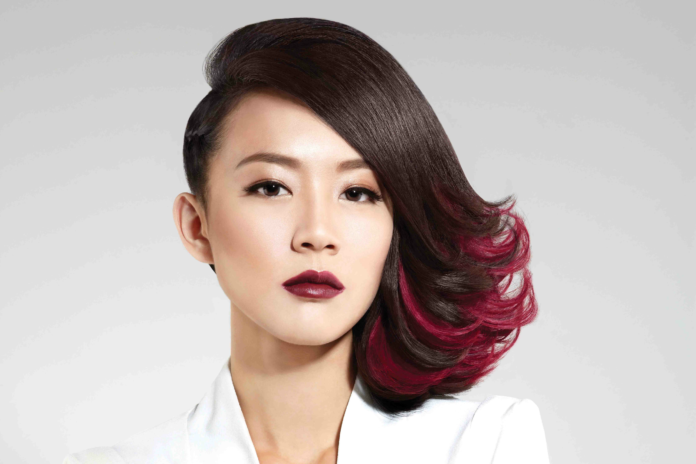 The rich, purplish tones in this red ombre style provide an extra glamorous touch when worn with jet black hair. 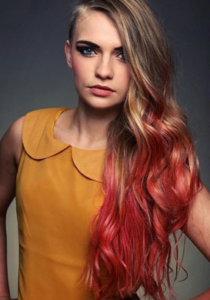 Unlike some of the muted pastel hair colors that embrace a more boho-chic aesthetic, this red ombre style is all drama and glamour. In a less frequently seen ombre style, these blonde locks have been enhanced with a rusty red ombre shade. 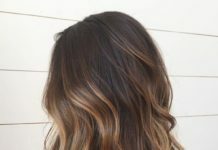 Luckily for the blondes, adding a darker ombre shade doesn’t require any additional bleaching, making this a low-risk ombre style that women with damaged ends can more safely experiment with. 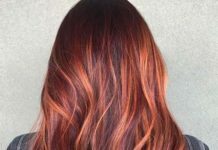 With natural auburn hair and a red ombre color that’s got brown tones in it, this look is fairly subtle when compared to other red ombre shades. In a high ombre style worn with an incredibly sleek blunt bob, this magenta ombre creation is a unique, high fashion style that will draw compliments everywhere you go. While some fair skin tones can look strange against bright neon hues, this pinkish red color can help to pull warmth from pale complexions. Adding a fiery touch to brunette hair, this copper ombre color is a fun and trendy way to add some extra warmth to your natural hair color. 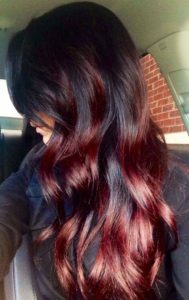 Hints of bright red color add a major boost to black hair, and create a gothic-chic look that will have you looking fearsome yet glamorous. 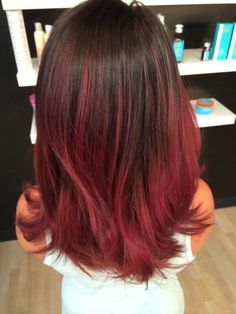 Using a color melting technique to get an ombre style without the obvious line of demarcation between the different shades, this red ombre look is dreamy and luxurious. 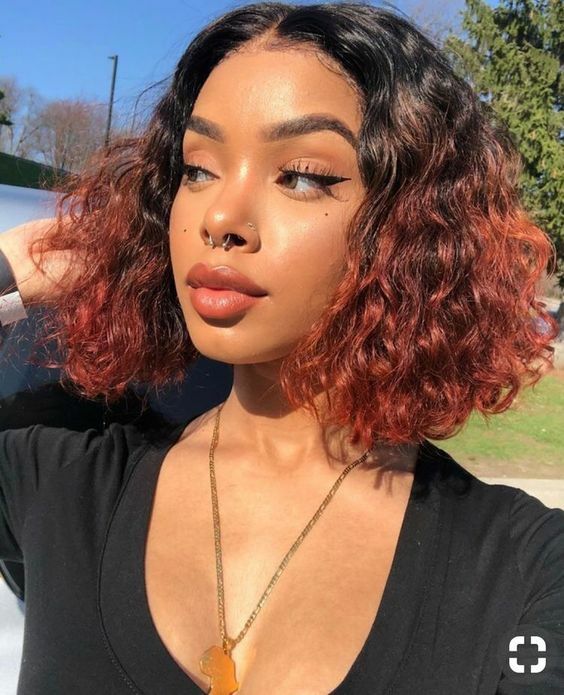 For dark brown hair that’s already full of reddish tones, this mahogany ombre is an instant match that looks bold and bright but not out of place. A scrumptious blending of pink and orange hues make this peachy copper ombre look good enough to eat. 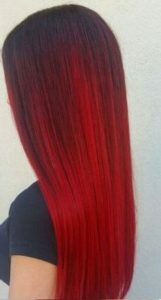 This is a great way to test out a slightly unnatural tone of red before taking the plunge and coloring all of your hair. 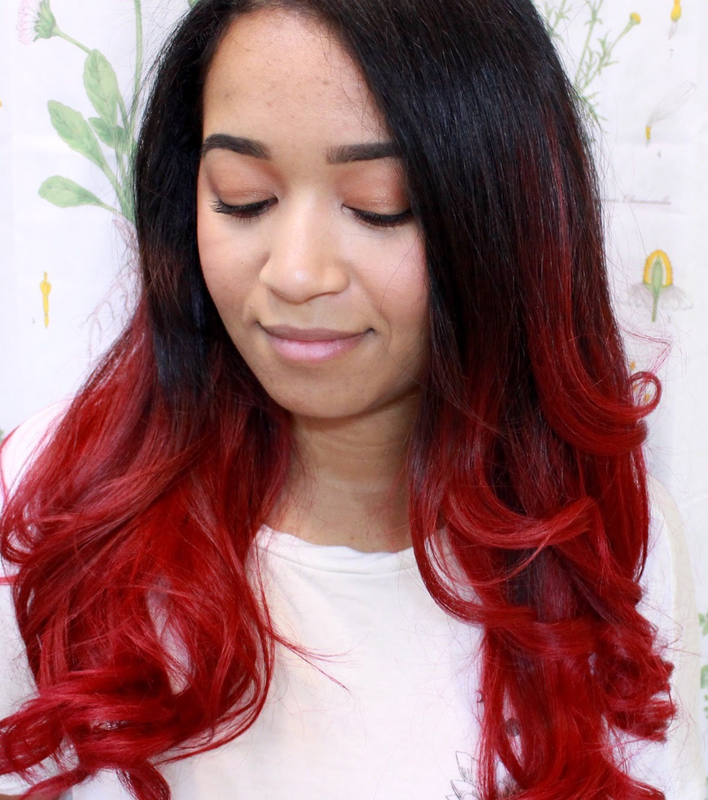 Bright and bold, this pinkish red bob is one of the most fun red ombre styles on our list. 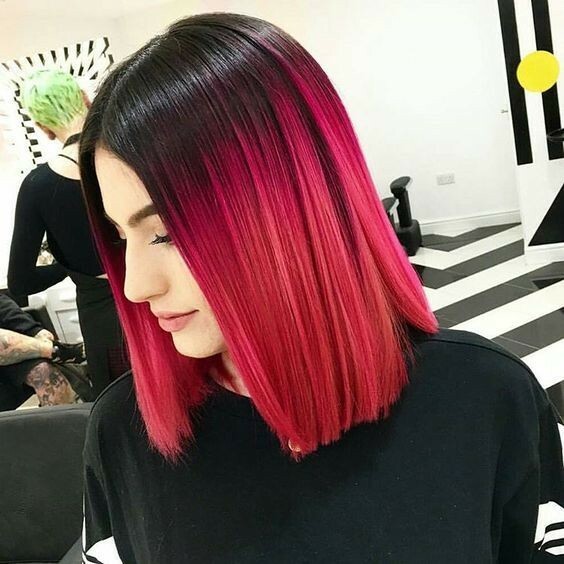 With a transition from dark roots to pastel pink ends, your hair will be looking lively even on days when you put in minimal styling effort. 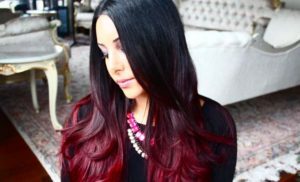 Creamy and rich, this red velvet shade breathes new life into your dark brown or natural black hair, and provides much easier upkeep than if you decided to wear this hair color from roots to ends. 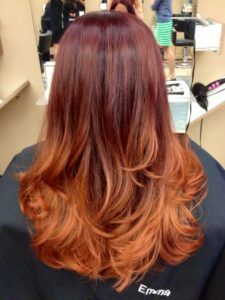 This copper shade makes for a natural looking ombre style when worn over auburn hair, and reminds us of rich fall foliage. If you like unnatural shades of red that are on the lighter side, pastels can provide you with a world of red ombre options. 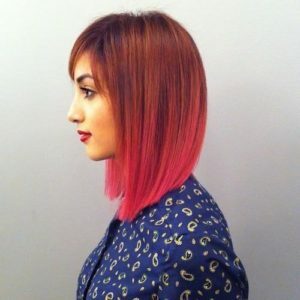 This salmon pink ombre is mostly applied to the underneath layers of hair, creating a bright, peekaboo ombre look. We’re absolutely loving the tasty-looking color combination of warm copper and pink sherbet shades. Combine this palette with a sleek, mid-length haircut and you’ll have one of the most chic red ombre styles around. Whether or not you choose to strike this menacing pose, this ultra long black hair with an intense red ombre looks a little on the devilish side. To keep your style from looking like a Halloween costume, take extra care to keep your hair healthy and sleek, and refresh your red color on a regular basis. 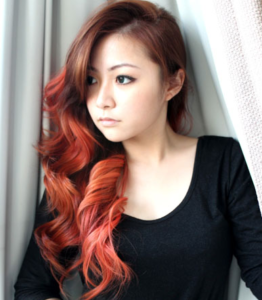 For a much more casual, DIY look, try a red ombre hair color over your dirty blonde hair without any bleaching or lightening beforehand. 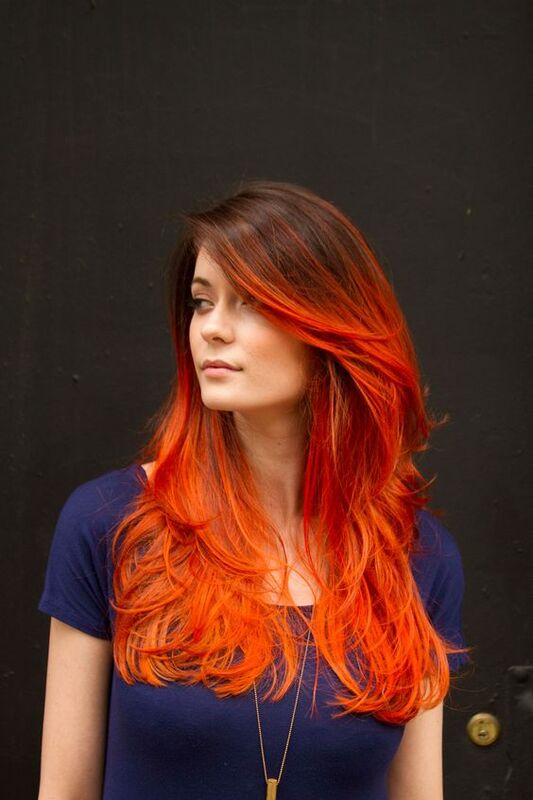 The end result will be a less intense color that you can let wash out if you’ve decided you’re over the look. 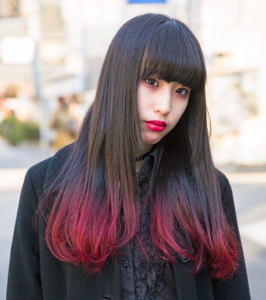 Fuchsia dip dye adds a fun dose of color to the ends of long, natural black hair. 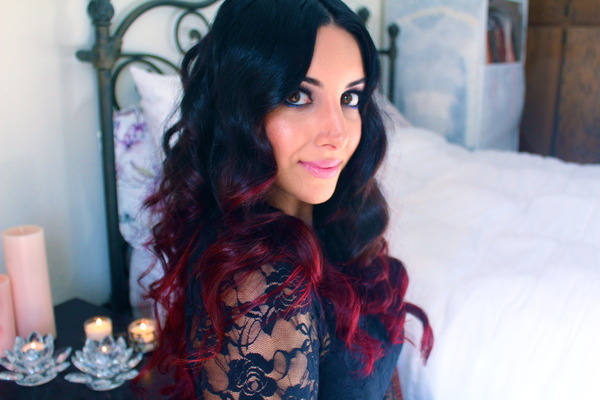 This bright, watermelon shade can look super dramatic when worn with jet black hair. Combine it with a natural brunette shade and you get a red ombre style that’s summery and fun! 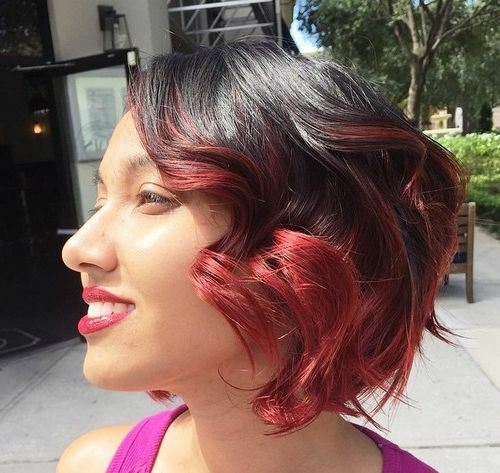 We love this center-parted curly bob! This red copper hair is bright but not too intense. 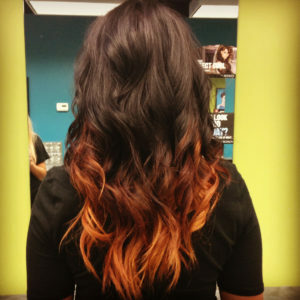 Show off your ombre color simply by pulling it up into a half high bun!